I am happy about the launch of Rebels Foundation and the support that the partnering organisations have shown towards it, says Kavya Ananth. 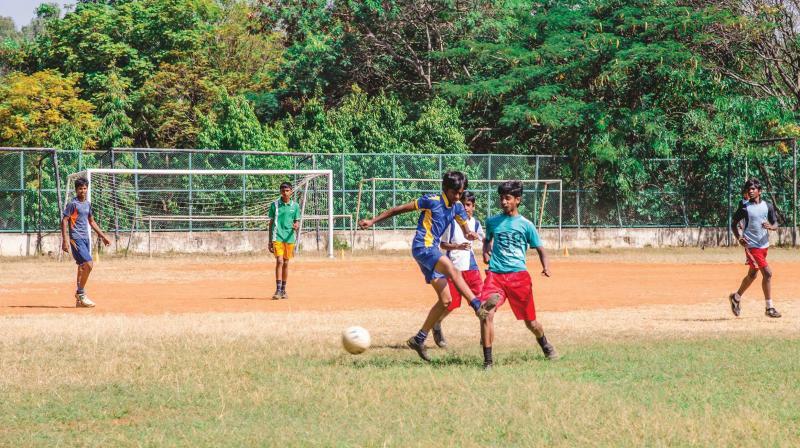 Bengaluru: Fifty children, all from underprivileged families, who have shown exceptional athletic ability, are currently receiving top notch football training. Why? These kids will be whittled down to 30 who are eligible for a football scholarship by the Rebels Foundation. They will, over the course of the next year, receive a complete football kit and regular training sessions. The founders of the Rebels Foundation come from the belief that sport can enrich our lives and bring about a holistic, positive change. The social service organisation aims at creating platforms and pathways for underprivileged children to hone their talent in sports and live better lives. "We are a group of like-minded people and we wanted to do something for the city's underprivileged children,” said Preetham Chandra, General Secretary, Rebels Foundation. “We did our research and found that there are many NGOs working for education and basic facilities for kids, so we thought about bringing sport into the picture. We believe that sports can give them a better quality of life and open up new avenues for their future as well,” he explained. “The aim of the foundation is to make a difference to the lives of children from the underprivileged sectors of the society by giving them equal opportunity to play sports. We strive to provide the best resources and opportunities to these kids, to maybe fulfill their sporting dreams and also to use sports like football, cricket, hockey, basketball and many others as a vehicle to build positive characteristics that will help them discover their inner talent,” adds Preetham. The foundation was officially launched in November. It’s been a little over a month and they already have fifty children from eight government schools under their wing. “By next year, we plan to touch some fifty government schools in the city, identify some 500 children in all and train them in football,” Preetham said. The Rebels Foundation is currently working with the Sports Authority of India on an exclusive talent identification program that will help underprivileged children succeed in life as they realise their dreams. Elaborating about the scholarship program, Preetham adds that thirty children will be selected for the scholarship, whereupon they will be trained by Sports Authority of India. The kids sports equipment and also their nutritional needs will be met by the Foundation, who have already roped in a sports equipment startup to provide the different types of necessary equipment. Rebels Foundation is in the process of selecting 30 (15 boys and 15 girls) children from underprivileged backgrounds from government schools. During the course of the selection, the foundation plans to supply the required football gear and training to all the kids participating in the programme.The selected children will then be inducted into the Rebels Football Scholarship Programme. The benefits of the scholarship program are being facilitated by the RFC Football Academy, who intend to provide a year's worth of training and guidance for these 30 talented children for the academic year 2017-18. These kids will be exposed to professional training methodologies to improve and hone their skills,” he explains.